New York : Scribner, c1999. A crooked father and an honest son are the protagonists of this novel on money laundering. The father is Tiger Single, owner of a British investment house, laundering money for criminals. His dream is to see his son follow in his footsteps, but the son is honest and will not have anything to do with him--until the father's life is threatened. When Oliver learns that one of his former colleagues has had his head blown off, he emerges to rescue his father from the same fate. To do this he becomes, in essence, a spy. The spy who came back to the bank. That is how le Carré very neatly gets around the whole problem of his banking thriller: he turns it into a spy thriller. Once this trick is turned he is back on his old turf and into his favorite themes: deception and suspicion and loyalty and betrayal. All of these he handles with his usual spark and originality. The moral center of the story is a young man who betrays his father in order to save him. In le Carré's hands betrayal becomes a form of loyalty. It is a rich idea, which le Carré writes richly. But try getting it across in a real bank! Le Carre exposes the dark side of international finance when the founder of a major investment house disappears, and his estranged son hunts global criminals to Zurich, Tbilisi, and Instanbul. This one is good. 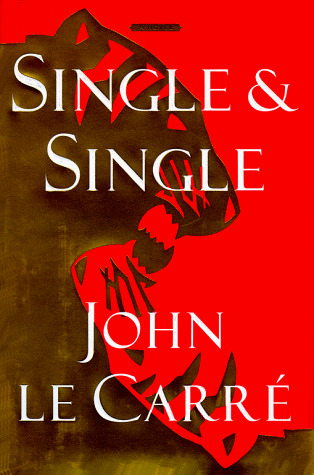 The complicated twists and turns of the plot are classic le Carre. Although LeCarre can still conjure up the right atmosphere of dread and understated violence, his plotting here is pretty weak. Oliver Single, son of international "entrepreneur" Tiger Single, is just shocked to find out that his father has built his finance firm by facilitating some pretty shady practices. So Single the younger goes to the authorities, etc., who put him through the witness relocation/new life kind of thing. A few years later a major deal goes bad for dad, who ends up disappearing ... has he just gone to ground? Do the evil Georgians have him? Single Jr., wallowing in Oedipal nuttiness, hooks up with some of England's finest to save the day! But really, ol' Tiger is just another international high-finance criminal w/o a "single" redeeming quality, so why should we care about him again? Ollie, on the other hand, must have something going on ... he's able to get two highly unlikely women to fall in love with him based pretty much on ... nothing. And let's not even mention Oliver's elder/perfect brother, dad's favorite, who conveniently died of leukemia before being able to grow up and take the reins at Single. Le Carré's latest, and if the spy genre has suffered with the collapse of the Cold War, the best of it, in the hands of someone like Le Carré, transposes nicely to the modern world of organized crime, huge profits from drugs, and money laundering by "respectable" bankers and lawyers. Such is the house of Single and Single which establishes, controls, and manipulates labyrinths of holding companies that tie into legitimate business and ventures, and complex ownerships across any number of countries. But it is a cutthroat world and one where allegiances and alliances are fragile and ever subject to the lure of even greater wealth, control, and power, often exercised through complete and easy violence. I am reminded of a conversation I had a couple of years ago when I was at Stanford U to participate in a seminar on APEC. One of the other participants was a former CIA agent and we chatted over breakfast. He noted that with the demise of the Cold War, more and more of the CIA's energies are focussed on trying to deal with organized crime with the Italian mafia compounded by the Latin American drug lords and the Russian mafia and crime families. It struck me when he said that the world was now incomparably more dangerous; when it was the CIA and the KGB, there were certain "rules of the game" that were understood in terms, for instance of the levels of violence that would be used or tolerated and where they might be applied; however, with the rise of the multinational crime syndicates, there were no rules, everyone was fair game, violence could arrive at any time, any place and it would be remorseless. You have revealed the full scale of your immense, infinite nothingness. At the brink of death, you have nothing to plead but your stupefying triviality. The answer was as clear to him as the question. That he had found it, and it didn't exist. He had arrived at the last, most hidden room of his search, he had prized open the most top-secret box, and it was empty. Tiger's secret was that he had no secret. The logical connection of these events and more is one of the many pleasures of this story of love, deceit, family and the triumph of humanity. Single & Single are a firm of financial enablers. Among their clients are the Russian capitalists, the Orlov family, out to make quick roubles. Their biggest scheme so far is the sale of "clean caucasoid" blood to the West. Money managers, the House of Single, Tiger Single, the senior partner, with his son Oliver, are set to reap a fortune. However events impair the smooth flow of cash, and the Russian partners turn to a new means of profit-making, drugs. As a lawyer in a financial management organisation, Oliver draws the line at drugs. It jeopardizes the future of the firm, and his own. He informs on his father to British government officials in the hope of cutting a deal. It takes four years for the government to act, and then their actions result in Tiger's disappearance. But it seems that Oliver was not the only one to betray Tiger. This was not an easy story to listen to, although narrated extremely well by Michael Jayston. The event with which the story opens, the death of Albert Wincer, really comes midway in the plot, and from that point on Le Carre feeds the reader tidbits, almost in the style of jigsaw puzzle pieces plucked randomly from the box. Sometimes the bits fit, and at other times we have to mentally set them aside for later use. If this was a held-in-the-hand paper book the reader would have the advantage of flipping backwards and forwards, re-reading bits, but you can't do that with an audio. What links a corporate lawyer facing death on a Turkish hillside with a children's entertainer from Devon? An interesting thriller spanning Europe from England to Georgia. Another great Le Carre. One of the first after the wall came down, and who the bad guys are isn't as easy to decide! I'm sure that Oliver's relationship with Tiger has some beginnings in Le Carre's own crazy relationship with his.